On October 14, 2014, our client went to work. At the time, he was working as a third-year apprentice dock builder on the Tappan Zee Bridge Construction Project. 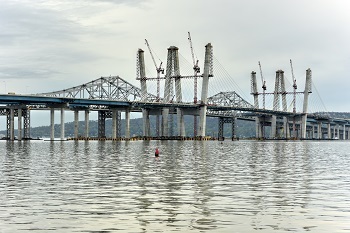 Our client was employed by Tappan Zee Constructors, LLC and Tappan Zee Constructors was under contract with the New York State Thruway Authority to construct the new Tappan Zee Bridge. As our client was doing his work on October 14, 2014, a jacking beam assembly that was being stored on top of an unsecured 12-inch by 12-inch piece of lumber cribbing fell and crushed his left foot. The jacking beam assembly fell when a Putzmeister concrete pump that was being hoisted by a crane knocked the beam off of the cribbing. At the time of the accident the jacking beam assembly was being improperly stored at an elevation and it was unsecured. The jacking beam assembly weighed approximately 6,000 pounds and fell a vertical distance of 12 inches on to our client’s left foot. The Tappan Zee Constructors Safety Department did its own investigation and found that there was no job hazard analysis done prior to the movement of the concrete pump on the day of the accident. The investigator found that a tagline should have been used to control the pump when it was being hoisted and that if our client had been holding a tagline then his injury may have been prevented. Immediately after the accident, our client was taken to the hospital for treatment of the multiple severe injuries that he suffered to his left foot. Within a 10-day period from October 14, 2014 – October 24, 2014, our client had four surgeries. Despite this quick and extensive treatment, he suffered permanent physical and psychological injuries because of the accident. While our client does not live in New York, we were able to pursue his recovery pursuant to New York law. New York has unique labor laws that protect injured construction workers, and these laws allowed him to recover more than he would have recovered if workers’ compensation was his only avenue of recovery. In this case, we argued that the New York State Thruway Authority was liable for failing to provide our client with a safe place to work and that our client’s wife also had a legal claim. Pursuant to New York law, the New York State Thruway Authority could not delegate its responsibility to provide a safe work environment to a contractor and our client’s recovery was not limited to a workers’ compensation claim. On October 11, 2017—just shy of three years from the date of our client’s accident and injury—we settled the claims against the New York State Thruway Authority for $3.8 million. Even today, our client is still suffering from physical pain, swelling, and a lack of a range of motion in his left foot. He is also suffering from permanent psychiatric damage including post-traumatic stress disorder, anxiety, and depression. Our client is unable to work. The $3.8 million that was recovered in the settlement will allow our client and his family to put money away for the future education of their young children. Their hard work benefits so many of us, but the dangers of that work should not be forgotten. It can be difficult to know which laws apply to you or what you can do to protect your fair recovery if you have been hurt while working on the Tappan Zee Bridge project. If you have been injured on the job you need to speak with an experienced work injury attorney as soon as possible. Contact us online or call us directly at 800.362.9329 to schedule your free consultation.